My family loves any recipe with sweet peas inÂ it. AsÂ it is starting to get warmer everyday, my choices for vegetables are becoming better than ever and I chose sweet peas a.k.a “Matar” in India as my spotlight for thisÂ dish.Â In IndianÂ restaurants you can find this recipe as “Matar Paneer” that translates as Peas and Cheese. Typically it is a dish with a gravy that is rich inÂ creamÂ and rich in spices. But I am not going to sign it off as a dairy recipe just yet. 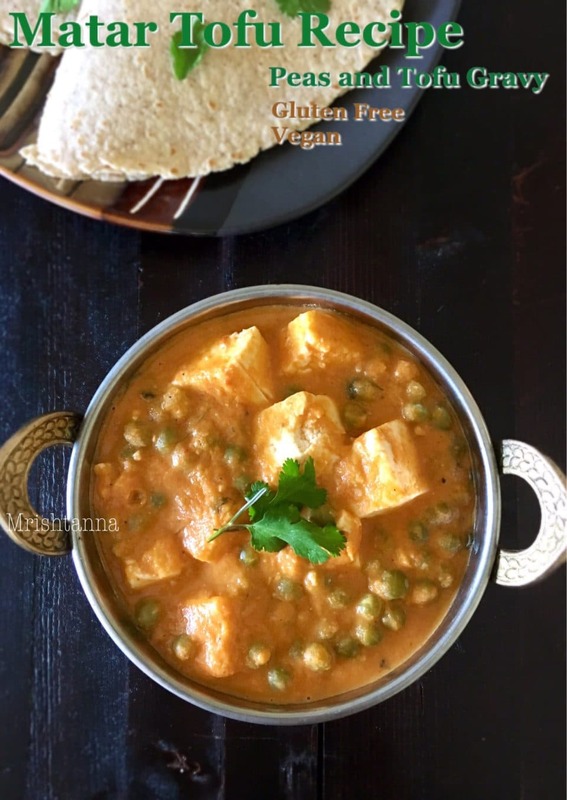 Not without trying.Â AndÂ here we are with a Vegan Matar Tofu Recipe or Peas Tofu GravyÂ Â that tastes just as good as in restaurants but lot more healthier!! The challenge is to find the right substitute for cheese and cream to match the originalÂ taste. Everything else is quite simple. I used Tofu and cashews to get the creamy consistency. Check out my short video and you will see how easy it is. Share my video and this page with your friends and let them how easy it isÂ to go vegan and still not give up what youÂ crave. You can also visit myÂ face bookÂ page and leave me comments. Blend chopped tomatoes, onions and soaked cashews (cashews soaked for 30 minutes in hot water) to a smooth paste. SautÃ© the tofu for 5 minutes in olive oil. In same pan, saute cloves, crushed cardamom, bay leaf, cinnamon stick in a teaspoon of oil for about a minute. Add crushed garlic and grated ginger and continue to sautÃ© for 1 more minute. Now, add the blended paste and mix well. Place a lid on the pan and let it cook for 5-8 minutes until the raw smell from onions go away. Add chili powder, garam Masala, coriander powder. Stir well. Cover the lid for continue to cook for at least 2 minutes. Add cooked peas or frozen peas and mix well. Add the sauteed tofu and stir gently. Place a cover on the pan and let it simmer for 5 minutes. As it starts to boil, remove the lid and add a little sugar, kasuri methi or dried fenugreek leaves. Garnish with cilantro. If you are using dry peas, be sure to cook it in a pressure cooker or stove top before you start to prepare this recipe. MatarÂ Tofu is ready to serve with rice or Indian flat bread. I love anything sweet peas. It’s so great to see your recipe because I always have to skip out on the paneers at Indian restaurants. Going to try this for sure! Thanks Mary 🙂 Even me too, so for that reason I like to add Tofu ! Love this! Tofu instead of cheese is so smart, and so much healthier. I really enjoyed your video. I should eat tofu more often. 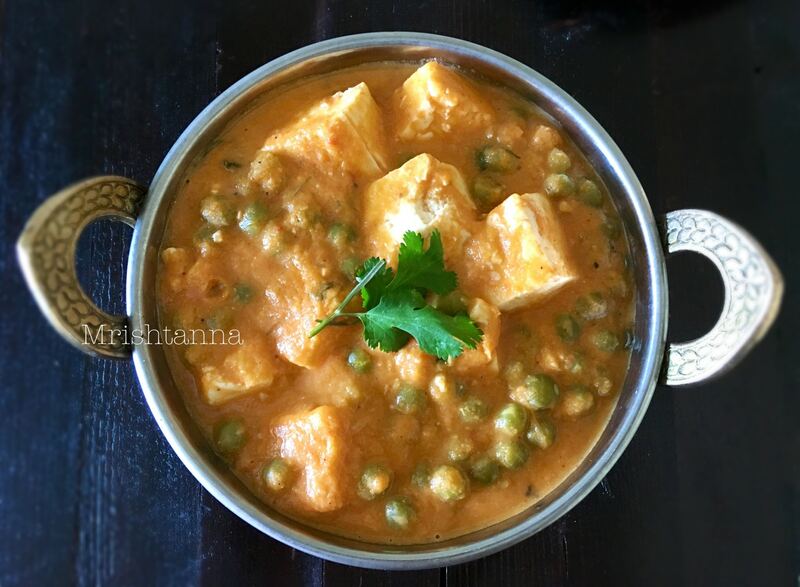 I love matar paneer and this looks just like that – so delicious. I will have to give it a try sometime! I love this recipe, Uma! So delicious and mouth-watering!